Linde Corporation is deeply involved in the Marcellus gas play, providing construction and support services for this historic new industry. 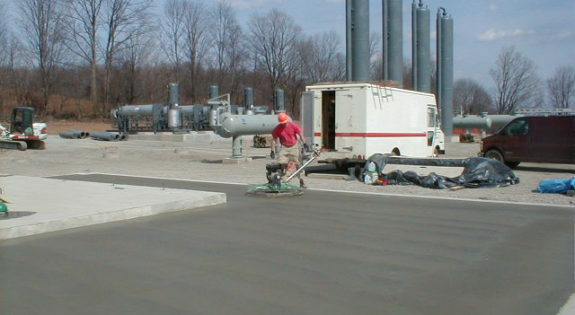 Linde Corporation also has a decades-long history in utility and infrastructure construction. Linde builds and upgrades municipal gas, sewer and water facilities all over the region and we have laid the groundwork for countless “big box” retail sites and distribution centers. 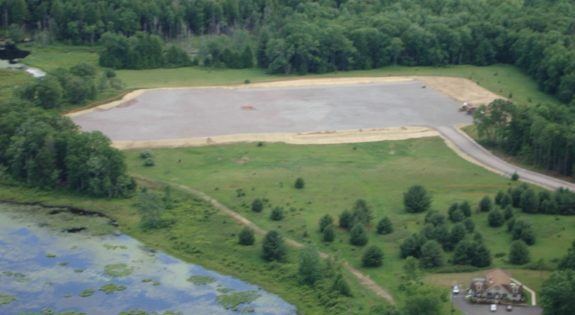 Linde Corporation constructed this well pad as a drill site for Marcellus gas exploration in Luzerne County. In this case, Linde coordinated closely with the gas company doing the exploration, the landowner and various right-of-way agents. 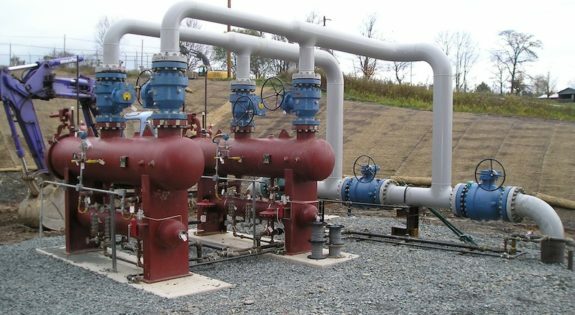 Linde Corporation built this compressor station in Susquehanna county transmitting natural gas from the wellheads to the main transmission lines. Linde Corporation did the site work, the concrete, installed the underground storm drains and did the E&S controls on the project. 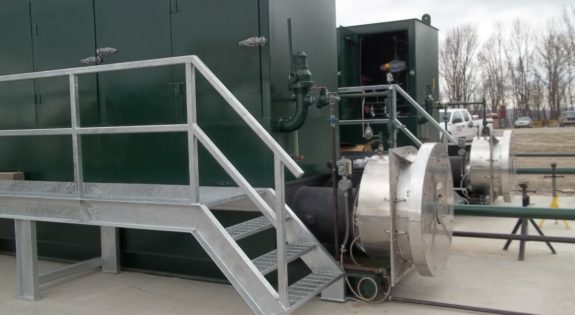 Linde Corporation built this compressor station in Susquehanna County, which prepares natural gas from local wells to be fed into the Tennessee Pipeline and on to market. Linde supplied foundation construction, compressor building foundation and slabs, M/C building foundation, generator foundation and slabs, mechanical and process piping and electric services. Constructing a proper water draw is a collaboration between private and government interests. Millions of gallons of water are required in hydraulic fracturing and that water must be safely drawn from public waters. Linde has extensive experience in safe water draw construction. 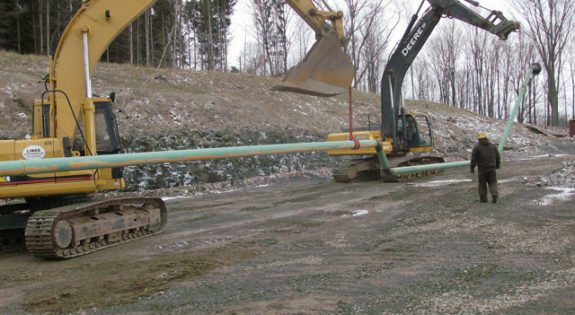 Cabot Oil & Gas hired Linde Corporation to construct the Salansky well/pipeline tie-in in Susquehanna County. The style of construction is new and allows gas production facilities to operate at much higher pressures. Where gas under high pressure may have been previously vented, now facilities can run at higher pressures more safely. 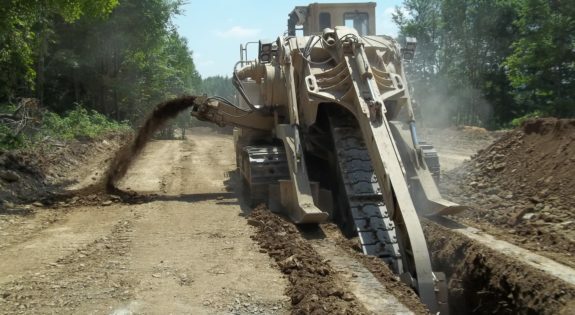 Linde worked on an access road in an environmentally fragile area. Click below to see a short video on the project: E & S Control from Linde Corporation on Vimeo. 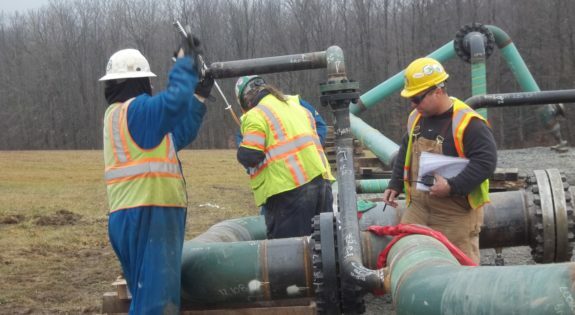 In this pipeline project in Susquehanna County, bore pipe was strung and welded before a horizontal directional drill could install the pipe under an environmentally sensitive area. Linde Corporation has completed miles of bores in the Marcellus region. 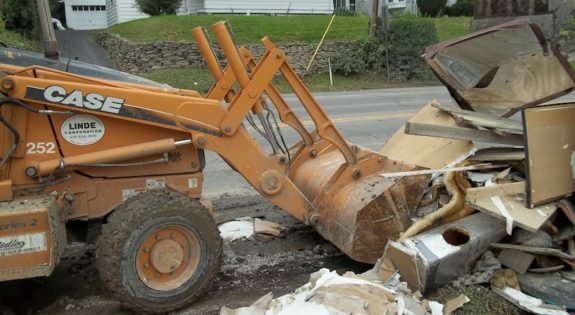 The pullback on a directional drill can be tricky due to logistical challenges. In this case, the pipe had to be strung through woods to facilitate the alignment. 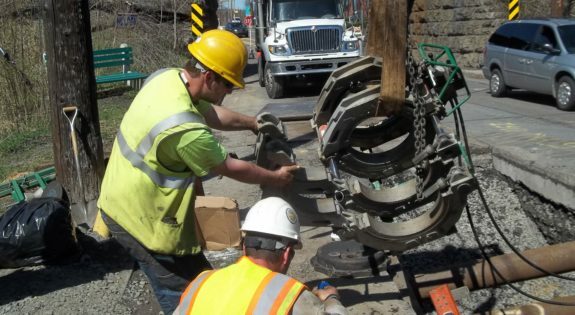 The photos show the pipe rollers at work guiding the pipe into the hole during pullback. This is an impressive demonstration of coordination and finesse. Excavators are carrying a riser leg section of 10” steel pipe to be set into place. 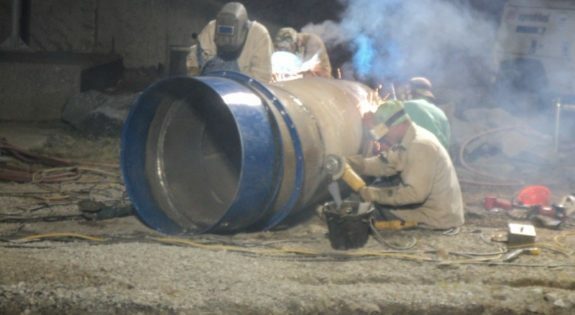 What follows are examples of prepping pipe for welding at a well pad. 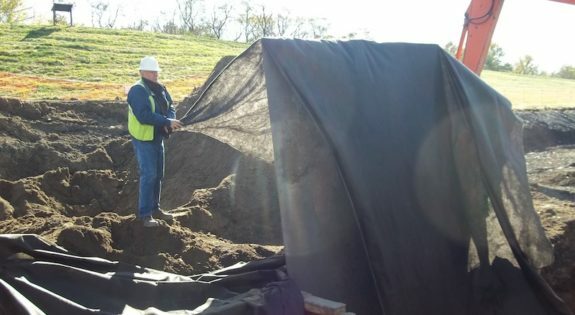 Linde Corporation has been a dependable partner to the gas firms at work harvesting Marcellus shale gas. 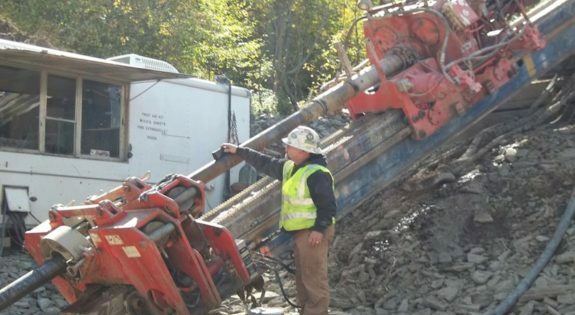 Linde Pipeline Division Manager Fred Ostroski has said that horizontal directional drilling in Susquehanna County operates at “the edge of constructability.” There are endless challenges and solutions to extracting natural gas from Marcellus Shale. Trenchless technology came to Linde naturally. Linde’s position is that we must have all the tools to offer quality work and trenchless technologies are a crucial part of that offering. To this point Linde has done countless miles of bores. 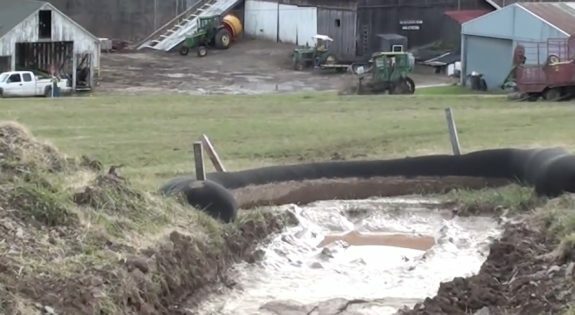 Stream crossings are very environmentally sensitive, as laying a length of pipe through a stream bed follows strict rules laid out by the state. 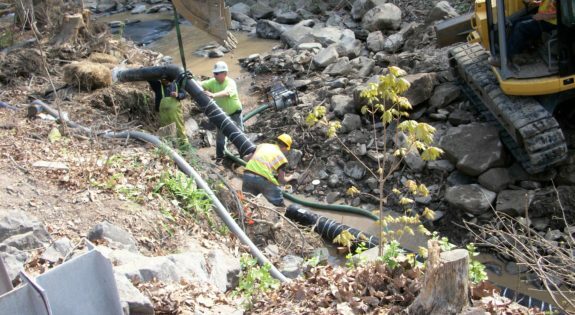 A typical stream crossing from start to finish, including restoration, must be completed in 24 hours. 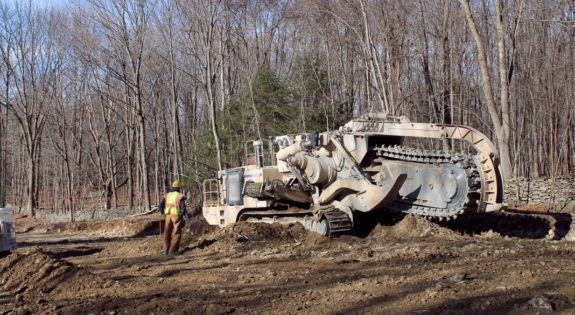 Pipeline work in the Marcellus region means negotiating hills. Linde Corporation is finding the Tesmec 1475 Trencher is up to the challenges the terrain provides. 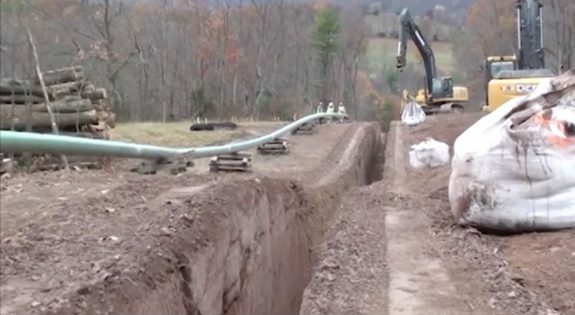 Linde Corporation works to set a pipe for a Natural Gas Pipeline in the Marcellus Shale Region of Pennsylvania. 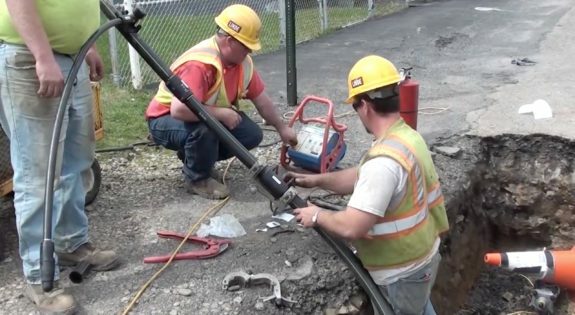 To see more, go to the video link below: Linde Sets a Pipe in Wyoming County from Linde Corporation on Vimeo. 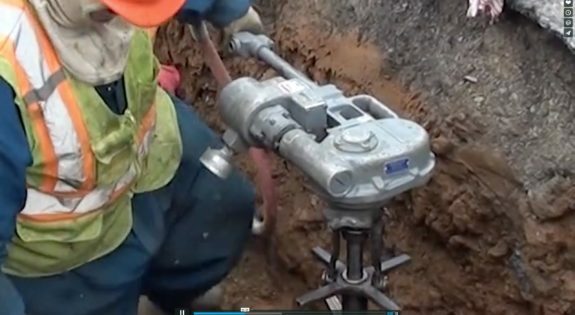 To watch a short video on one of Linde Corporation’s many directional drill projects, click below Directional Drilling in Wyoming County from Linde Corporation on Vimeo. 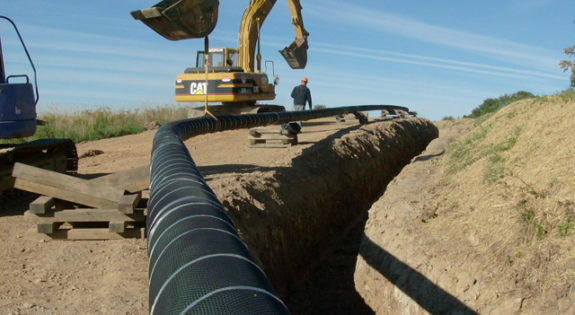 High pressure oil and gas pipelines which are already in the ground are tested for strength by pressurizing them to at least 125% of their maximum operating pressure (MAOP) at any point along their length. The steel is stressed to specified minimum yield (SMYS) and above during the testing. Testing for leaks is performed by balancing changes in the measured pressure in the test section against the theoretical pressure changes calculated from changes in the measured temperature of the test section. 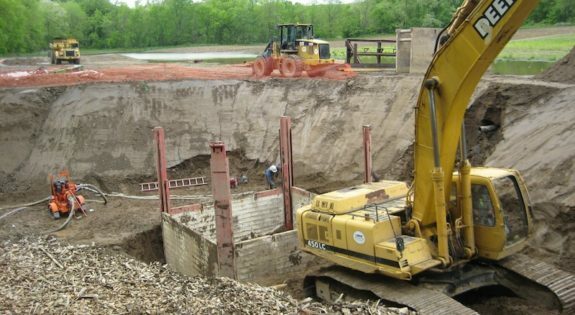 The Army Corps of Engineers noticed water bleeding from underneath the dikes at some points in the Wyoming Valley during the record high waters of 2011. Linde was tasked with collecting that overflow. Third St. Mt. Carmel, PA, Northumberland county. 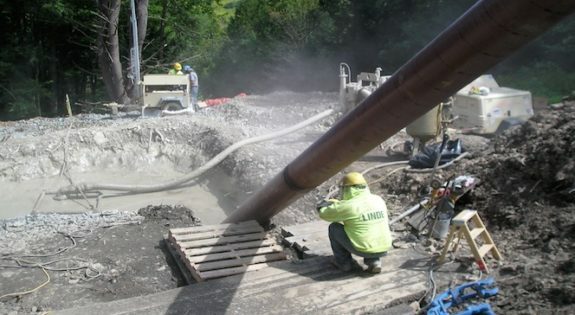 On this project, Linde Corporation was hired to install 3800 lf (linear feet) of ductile iron pipe. In addition, the project specs called for 7 fire hydrants and 145 services to be added. This project was estimated to take 130 days from beginning to end. It was begun in June of 2011. 2011 was the wettest year ever recorded in Northeastern Pennsylvania. By the time the remnants of two tropical storms came calling in early fall, the ground was already saturated from the summer rains. The Susquehanna River crested at nearly 43 feet, its highest level ever. 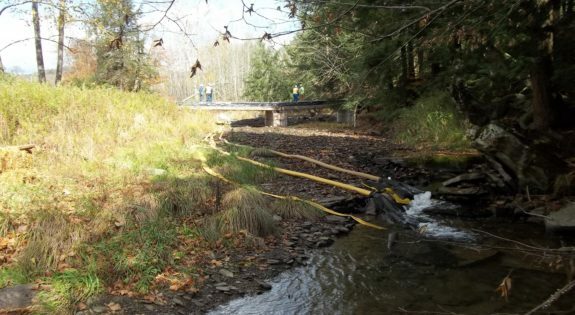 What follows are three Linde utility projects, each triggered by serious, water-related events in Luzerne County, Pennsylvania. When a sewer pipe leaks it is serious business. When that pipe is 36” wide and located next to the Susquehanna River, it is immediate serious business. Linde was on-site to begin another project when we discovered the problem and alerted the Wyoming Valley Sanitary Authority. The timeline roughly went like this: Linde discovered the leak the morning of October 5th, the WVSA mobilized on the 6th and from October 7th until the 10th work went on around the clock. A water main break is always an emergency since we all need water dependably and safely delivered to our taps. When that water main break happens in the middle of a creek, the safety risk spreads from humans to the ecosystem surrounding the creek. It requires an immediate response. 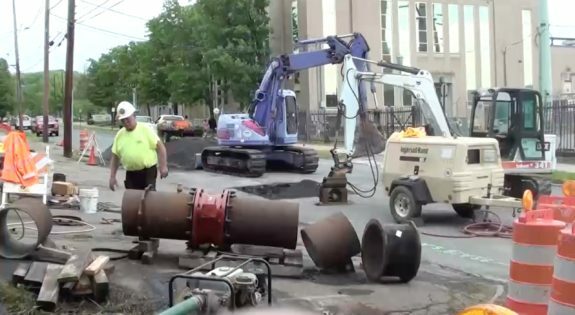 Linde Corporation was called in by the Pennsylvania America Water Company (PAWC) to repair a 24” water main on River Street near the Wilkes-Barre General Hospital. 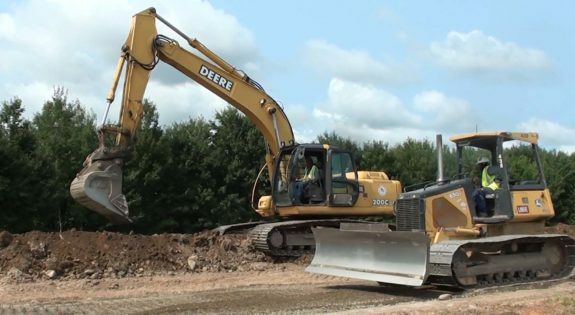 This is a gas insertion project performed by Linde Corporation and under way in Hazleton. 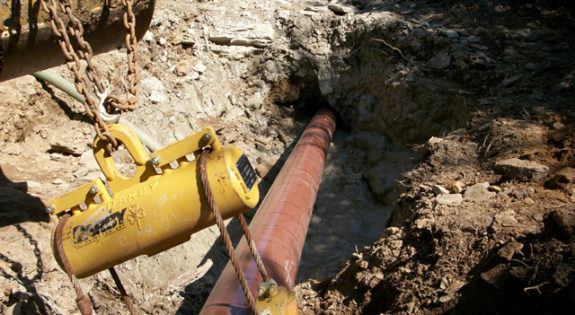 The concept here is to replace existing cast iron and steel pipe by inserting high density polyethylene—or HDPE pipe inside the old mains. 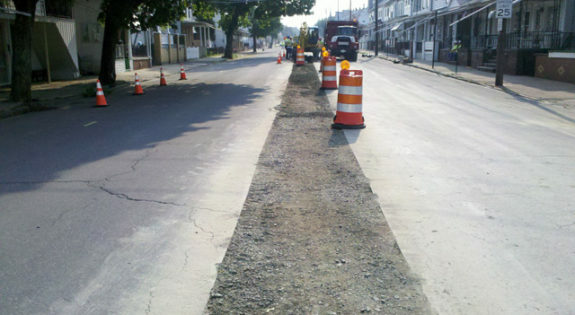 Linde repaired a broken water main on Larch Street in Scranton. Click on the link below to see a short video on the project Larch Street Project Video 2 from Linde Corporation on Vimeo. 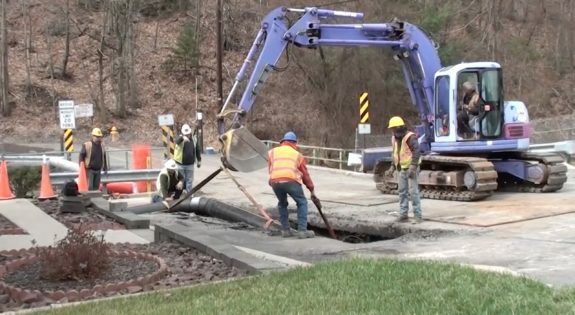 Linde Corporation upgrades water mains in Bethlehem, Pennsylvania. To see more, go to the video link below: Bethlehem Insertion Project from Linde Corporation on Vimeo. 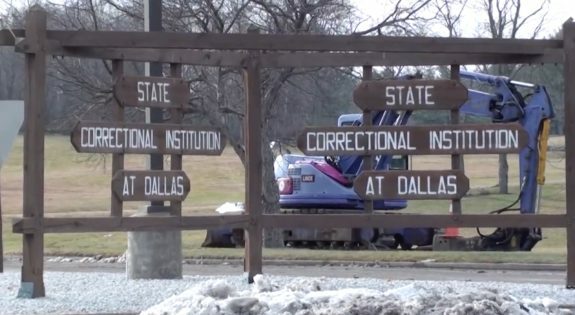 To see a short video on Linde’s Dallas Prison Project, click below Dallas Prison Project from Linde Corporation on Vimeo. To see a short video on our project on Stafford Street in Scranton, click below. Stafford St Video from Linde Corporation on Vimeo.